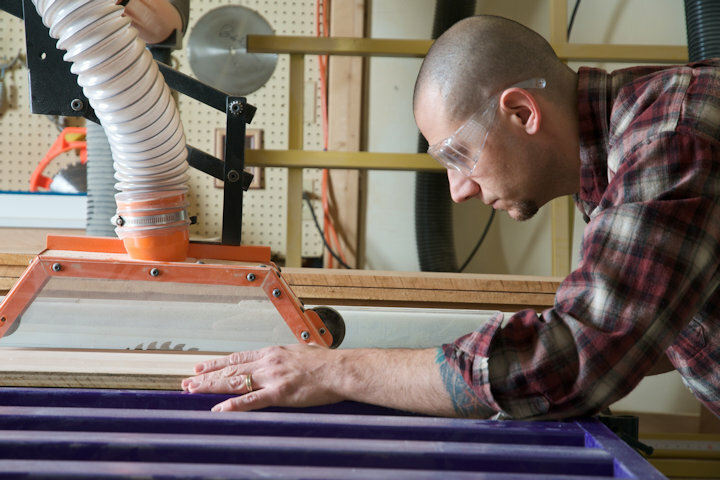 Safety must be a top priority for any woodworking shop. Recent studies have linked sawdust and debris from workshop power tools as fire, tripping and health hazards. Dry, fine wood shavings can spread across a workshop floor and become incredibly slippery to walk on. If the shavings are airborne and a spark ignites, a fire can quickly spread throughout the shop. Breathing in the dust from machines has also been identified as a risk factor for throat and lung cancers. Taking the time to install dust-collecting solutions will make your work safer and more enjoyable. There are a few options for dust collecting in your woodworking shop, depending on the machines you use, the size of your shop and your budget. No matter which style of dust collection you select, be sure that the dust and debris move quickly and safely through a fine filter to trap the smallest of particles. • Shop Vacuum: For small power tool usage, a shop vacuum may be enough to clear away the dust. A shop vacuum usually comes with a hose that can fit into many tools with a hose adapter. If your tool does not include its own adapter, a universal adapter is an easy way to make every tool dust-free. A vacuum hose that is 1¼-inch diameter is recommended for easy movement and safety around the shop. • Single-Stage Bag Collectors: This style of dust collection is on a much larger scale than a standard shop vacuum and was the standard for years. The dust is collected through a fan and into two bags, one that is not porous for large debris, and one that is slightly porous, to filter out dust. Unfortunately, single-stage collection falls short due to issues with filtration and bag thickness, as it can’t capture the smallest particles. • Two-Stage Bag Collectors: There are two types of two-stage collectors: Cyclone and Barrel. Barrel collectors collect large debris in a barrel before kicking the remaining dust through a bag for filtration. Cyclone collectors use a cyclone chamber to push large pieces into a barrel and to filter the dust internally so that only clean air is pushed out. The Cyclone dust collector is considered the best on the market, as it offers the best air quality possible. When hooking up a dust collector, the tubes and pipes used are just as important as the filtration system offered. The flexible hose works well for a vacuum’s motor and filter, but most large dust-collection systems require sturdier materials. PVC pipe and metal ductwork can both be used for this, but ductwork seems to be the most efficient and puts less stress on the motor. Choosing a dust-collection solution for your workshop can be a complex choice, but it certainly is a necessary one. Even with the best system, your air quality may still be poor if the room doesn’t ventilate well. Use a dust mask or respirator while you work, to ensure that the air you breathe is safe. Finally, never forget the simplest and most reliable dust collection tool in your arsenal: your broom. Sweeping your shop regularly will put less stress on your dust collector and can prevent future injuries. Oneida Dust Deputy – Best $25 i,ve ever spent for my shop. Attached to my bucket, gets 99% of whatever I through at it. I bought my Oneida Dust Deputy nearly a decade back. I paid two hundred for the metal version, because it went out on jobs with me. I had been trying to solve dust problems that clogged my vac filters after three to five minutes of run time. I’d build a water filter using a drum and it worked great, by foamed badly and disposing of the sludge was problematic. I took a risk and bought the Deputy and have never looked back since. The Deputy’s performance was so good I bought a three horse Oneida Dust Gorilla (large cyclone), a Super Dust Deputy and am now consider the Super Dust Deputy XL. The cyclones on my big collectors allow me to vacuum the floor and not worry about things going through the impellers of the collector and damaging them. I am even able to retrieve the items erroneously picked up during vacuuming. I should add that my Super Dust Deputy has handles and wheels to make it easy to move about. I bought a Harbor Freight “2hp” collector and installed large wheels and handles on it too. Both wheel out to the lawn where I use them to vacuum pine cones before mowing, and to pick up leaves in the fall. Vacuuming the leaves out of my wife’s flower beds removes them without trashing her beds and flowers. I have also used this combination to vacuum paint chips off gravel, when the chips were left from the painters.